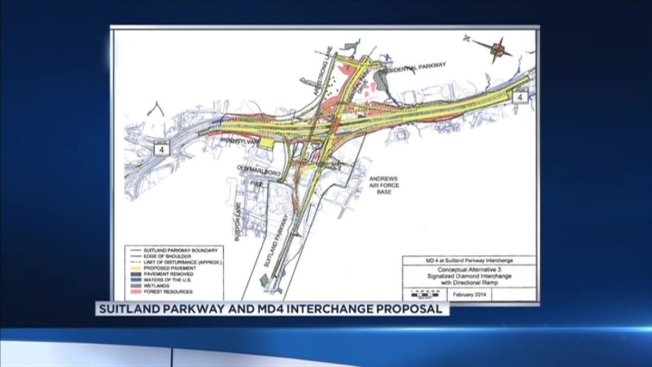 Major Facelift Planned for Suitland Parkway at Pennsylvania Ave.
A plan to lower Pennsylvania Avenue (MD4) and raise Suitland Parkway to run over Pennsylvania is being discussed by the Maryland State Highway Administration and the National Park Service. The intersection is a major crossroads for commuters in Prince George’s County. The plan, which is still in early stages, could make traffic move more efficiently. "We're separating the two roads so you wouldn't have the ability if you're traveling on one to have a crash with another car on the other one," said Valerie Burnette Edgar of the State Highway Administration said. "You'd be completely separated by bridges." The $120 million project is already funded, Prince George's County Bureau Chief Tracee Wilkins reported. The State Highway Administration, which oversees Pennsylvania Avenue (MD4), must acquire land from the National Park Service, which operates Suitland Parkway, before the project can begin. "Once this project, assuming it goes forward and gets built, the State Highway Administration would take over the section of road that is currently theirs and continue to maintain it," Edgar said. The National Park Service wants public comment on the idea. Review the plan at the National Park Service website or the State Highway Administration website.